Noise pollution in the ocean is increasingly recognized as harmful to marine mammals, affecting their ability to communicate, find mates, and hunt for food. But what impact does noise have on invertebrates – a critical segment of the food web? 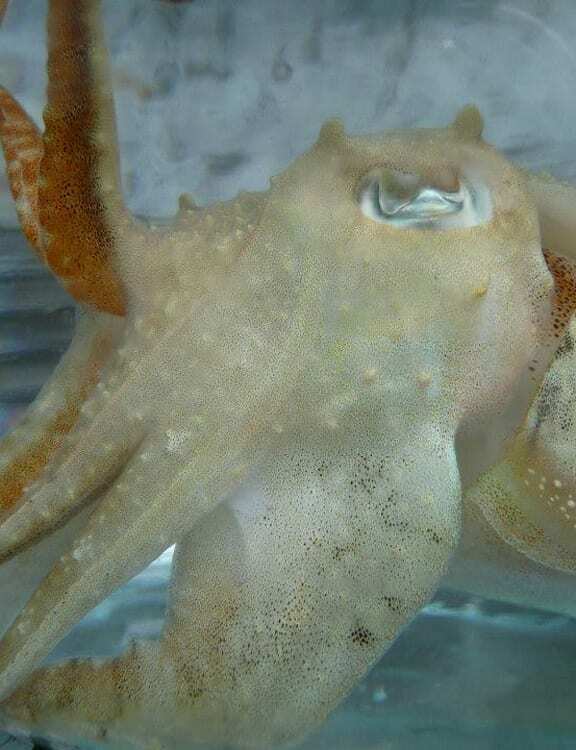 A new study by researchers at Woods Hole Oceanographic Institution and their colleagues examined behavioral responses to sound by cuttlefish, a type of shell-less mollusk related to squid and octopi. The study is the first to identify the acoustic range and minimum sound sensitivity in these animals. Their findings, published in the Journal for Experimental Biology, can help decision makers and environmental managers better understand the impacts of noise in the ocean. Some studies have inferred loudness by measuring how fast an animal responds to sound. But, says Mooney, that requires a leap in logic to conclude the animal perceives a sound as louder by measuring how fast the animals runs or swims away. He was interested in a well-designed, controlled study that measured all the right variables to truly map what a cuttlefish hears and its sensitivity to sound. Mooney and lead author Julia Samson, then a student in Mooney’s lab, set about to design a study to test hearing in cuttlefish, one animal at a time. Their plan relied on previous studies by co-author Roger Hanlon of the Marine Biological Laboratory (MBL) in Woods Hole, who had observed and defined a series of behavioral responses in cuttlefish, such as inking and jetting, mild color change, and twitching. Each response is associated with a perceived level of threat to the animal. For example, inking and jetting is done when cuttlefish predator is close by or they perceive some other threat; mild color change and fin movements demonstrates a reduced level of aversion such as when the animal is startled but not in fear for its life. Twitching is another behavior indicating a very mild response to a stimulus, from which the scientists can determine the sound is perceived but that it requires little response. Functionally, cuttlefish hear in ways similar to fish. They have an inner ear bone or otolith, which is like tiny grain of sand made of calcium carbonate, the same stuff corals are made from. “This little stone sits on a bunch of hair cells, and the sound wave literally moves the animal back and forth – like when we stand close to a speaker and it vibrates us back and forth,” Mooney said. The animal moves but the dense stone slightly lags behind and it bends the hair cells, and generates a nerve response in the brain. “It’s like being on a rollercoaster and your body takes off faster than your stomach and you detect that movement,” he added. Using a test tank at WHOI, the researchers measured the responses of 22 cuttlefish to a range of sounds at different frequencies and loudness levels. The tank itself was calibrated twice. First, the sound pressure—which is like the vibration we feel when standing near speakers at a rock concert—was measured at several locations in the tank using one hydrophone. 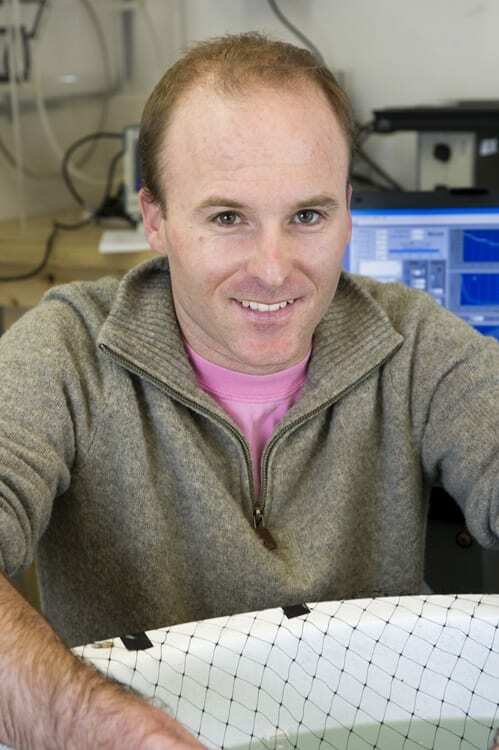 Second, the particle acceleration—the ‘rollercoaster’ phenomenon Mooney described—was measured throughout the tank using two hydrophones to measure the sound pressure difference and derive the acceleration from this difference. The researchers introduced individual cuttlefish to the tank and gave it some time to settle down in its new location. Then the researchers would play a sound and scored the animal’s behavior. Each animal was exposed to four sounds per day, at random frequencies and levels. Depending on which frequency the animal was exposed to, there were different physical responses. The researchers determined that cuttlefish hear in the same range as fish – approximately 80 – 1000 Hertz (Hz). This enables them to hear reef sounds, fish predators, and other biological activity – coincidentally the same range where there is lots of anthropogenic noise like seismic testing using air guns, small boat and commercial shipping traffic. The study also suggests that cuttlefish possess loudness perception—a measure not just of sound level but also frequency—and that they can functionally use the sound to avoid a predator. In a separate test, the team also exposed the animals to the same sound once per minute over 30 minutes, to see if the animals habituate to sound. Future studies will take the research out of the controlled environment in the lab and into the ocean to attempt to measure whether anthropogenic noise impacts their reaction to other sounds. WHOI biologist Aran Mooney is interested in how animals detect the world around them, how they find food, communicate, navigate and avoid predators.